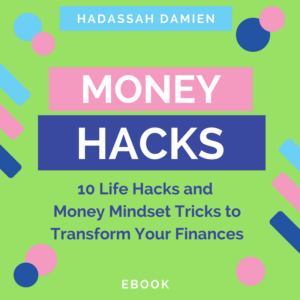 Get into #hackingcapitalism with MONEY HACKS: 10 Life Hacks and Money Mindset Tricks to Transform Your Finances! Navigating the social and economic systems that create the complex and often unfriendly world of finance, credit, and debt means finding your way around impediments. Hacking money, if you will. 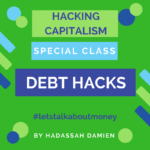 This book + supporting course are focused on 10 hacks that will allow you to navigate systems in capitalism more easily. From evading shame and self-judgement, to getting out of debt and saving for your future self, there’s a new tactic for everyone to learn! 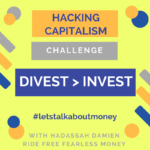 Take the concept of workaround from hacking, and add progressive and anti-capitalist values and you’ll get motivation and instruction on how to move past freezing and fear into positive action around money. Need tools and motivation to get your finances sorted? I’ve got you with this eBook! Real talk about money and class. Life hacks that are strategic, intersectional, and give banks less money, and our futures and each other more. Money mindset frameworks that are trauma-informed, self-care led, and radical in application. *PDF eBook* // *Kindle eBook* // forthcoming soon! Finally, closing thoughts and inspiration because guess what? It’s not you — it’s capitalism, and the intersectional oppressions linked into it. Navigating social and economic systems that create the complex and often unfriendly world of finance, credit, and debt often equals finding your way around impediments. Given the toxic nature of these interactions, it can seem temporarily better to avoid dealing with personal finance — but as those of us who’ve avoided know, it catches up with you. Dealing with the guilt of choices that don’t match our ethics (banking with Wells Fargo? Citibank?…) or fallout from personal economic hardship (behind on debt, bad credit) takes energy from our lives – energy which could be used MUCH better in movements, activism, creative pursuits, or just leisure. You don’t have to like “the system” to navigate it well! As a matter of fact, those of us who are not “insiders” of systems are often great at navigating them — we’ve had to figure out how, which is an advantage. 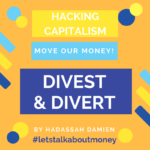 March 2017 — Divesting from Banks & The History of Banking, hosted by BANKERS, an ad-hoc group of activists looking to turn the ball and chain of consumerism, now being used to keep us down, into our best weapon against the oligarchy. Feel free to contact me to do a talk at your school or community group!